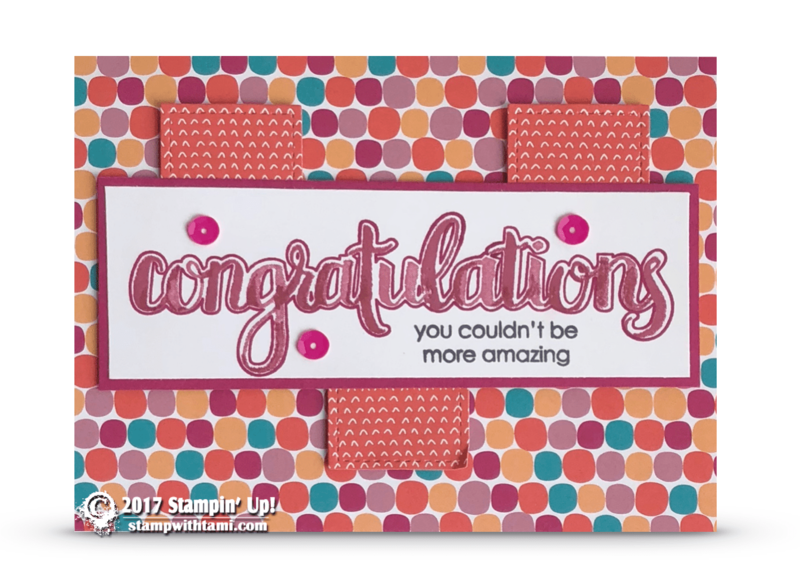 “Congratulations – You Couldn’t Be More Amazing” from the Stampin Up Amazing Congratulations stamp set. This set was created so you can stamp a multi-colored brushstroke effect (see instructions below). The “congratulations” is stamped in 2 ink colors: Berry Burst and Sweet Sugarplum. Then layered over some bright and cherry Tutti-Frutti Designer Paper. The matching Berry Burst sequins are from the Tutti-Frutti Adhesive backed sequin collection. What a lovely card, I absolutely love large sentiments. This sentiment is great because not only is it large but it is also created with more than one stamp. Cool!